Every day, millions of people are admitted to hospitals, embarking on patient journeys on the road from sickness to health. These patient journeys are at once unique and complex, with many potential paths along the way. Many things impact the ability of the patient to heal, with the most important being the patient’s care team. Including each team members’ individual perspective, experience and knowledge. Unfortunately, hospitals and patient care settings are culturally challenged institutions that do not immediately facilitate collaboration, enable discovery of new ways to treat patients, or address unique patient journeys. Instead, nurses, doctors, and other involved in patient care are focused on different goals and requirements and do not have the opportunity to apply their years of experience, learning and research, making the most valuable tool in the healing process, untapped. weDiscover is a clinical transformation tool that is specifically designed for all care teams and stakeholders involved in the patient journey within patient care settings. 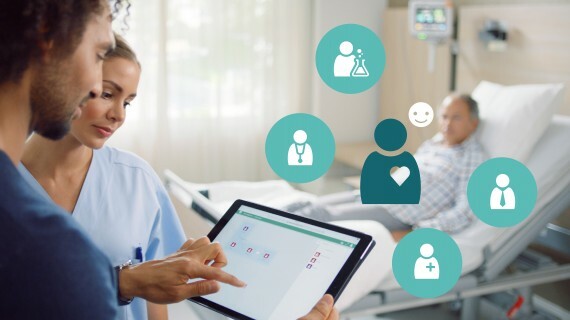 It connects all care givers in a collaborative methodology which redesigns clinical workflows tailored to each individual patient journey. We began prototyping ideas on paper 2 years ago and worked with countless care teams in hospitals to create weDiscover. We iterated our ideas and created a fully built solution, which is currentely being rolled out. weDiscover represents the values of EMPOWERING by enabling care team members to provide the best possible patient care by leveraging one another’s experiences and identifying the best way to treat their patients in a way they never have before. weDiscover represents the values of CONNECTING by bringing together the multitude of individuals that make up the care team and enabling them to communicate and bond over their unique histories and experiences in a simple, accessible manner.